At Fertimix, we can help provide the best possible results for your growing environment. Whether you have a large growing area or just a few trouble spots, we can help. Nitrogen, Phosphorus and Potassium are usually considered the main nutrients in fertilizers. However, there are other nutrients that can be added for better results. Calcium, Magnesium and additional micro-nutrients can also be added to create a successful fertilizer program. Contact Us for more information on soil analysis and custom fertilizer programs. 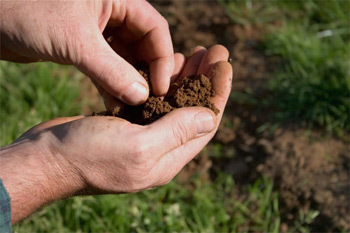 Useful soil analysis test results depend upon collecting an accurate representative sample of the growing area. For smaller areas such as residential lawns collect 5-10 samples spread throughout the entire area. For larger growing areas such as athletic fields or municipal grounds collect 10-15 samples. Each soil sample should be a composite of subsamples collected from randomly selected spots within the chosen area. Collect the samples in a clean plastic pail, mix the soil thoroughly, and put about one pint of this mixture in a sample bag or box. Label the sample container and keep a record of the area represented by each sample taken. Once the soil analysis results are obtained we can build a custom fertilizer program designed on the exact nutritional requirements of your soil condition and what is being grown. Feel free to Contact Us to discuss all of your fertilizer needs!